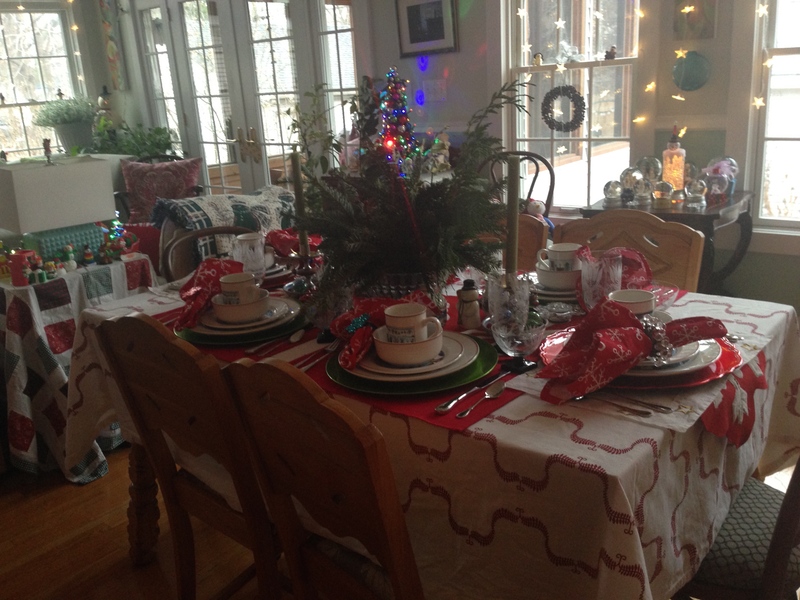 Last month, Peggy hosted our third annual Book Club Christmas Tea. As usual, it was a festive event with everyone contributing something tasty. I made this Japanese egg salad, which was delicious. (I take no credit…it’s just a good recipe!) I am not a fan of curry usually, but I really did love this egg salad. In addition to the egg salad, we had ham salad, cucumber sandwiches, and chicken salad served in little bread boats, lemon cranberry scones and English toffee scones served with lemon curd, cream and cranberry butter, grape salad, toffee pudding, plum cake, and Christmas cookies. (I think that’s everything!) I also made this shrub to serve with prosecco. I’d never made a shrub before, so I was a little bit worried, but it turned out really tasty. (Though next time I will crush the peppercorns a bit more because it was lacking the peppery bite.) And, because I think every party needs a little paper element, I made these simple place cards out of some red cardstock, my Yellow Owl Workshop stamp embossed in white, and some Jolee’s holly stickers. Peggy’s tables were delightfully decorated, as always. We read The Bird’s Christmas Carol by Kate Douglas Wiggin. It was a perfect read for December when everyone is busy. (Last year, we attempted an Austen novel and hardly anyone finished.) Most of us finished it in one relaxing afternoon while sitting by our trees. And though it was only eighty pages and maybe more of a tale for children, we found so much to talk about, even comparing it to The Dead. I recommend it if you’re looking for a sweet tale to read this December. 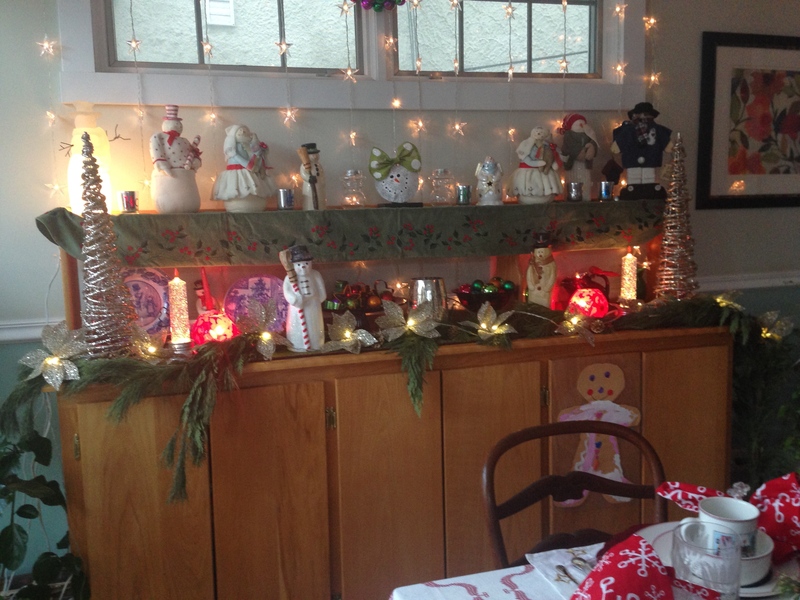 So much work goes into planning this thing–especially by Peggy since she decorates, sets the tables, and cleans up after we all leave!–but it is so worth it. We are already talking about things to add for next Christmas! 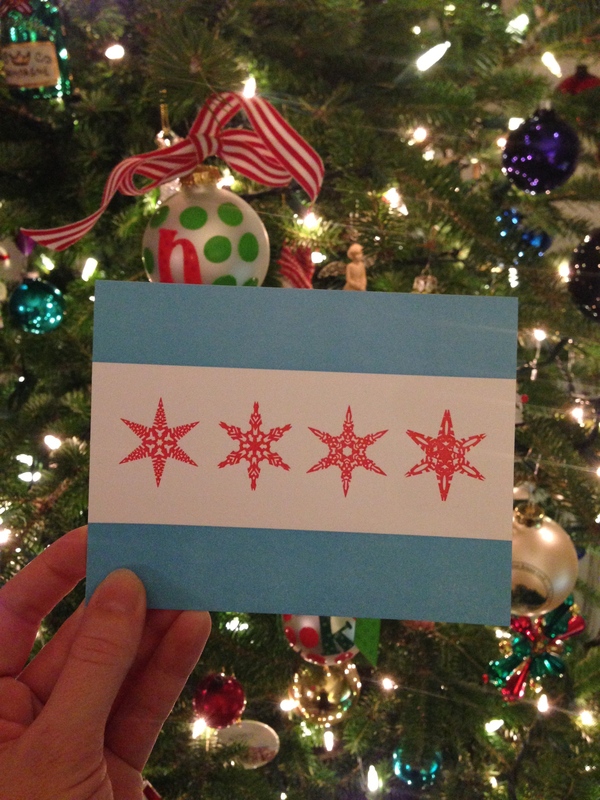 Tomorrow, I’ll be joining Kathy and Donovan for the LWA Holiday Virtual Letter Social. 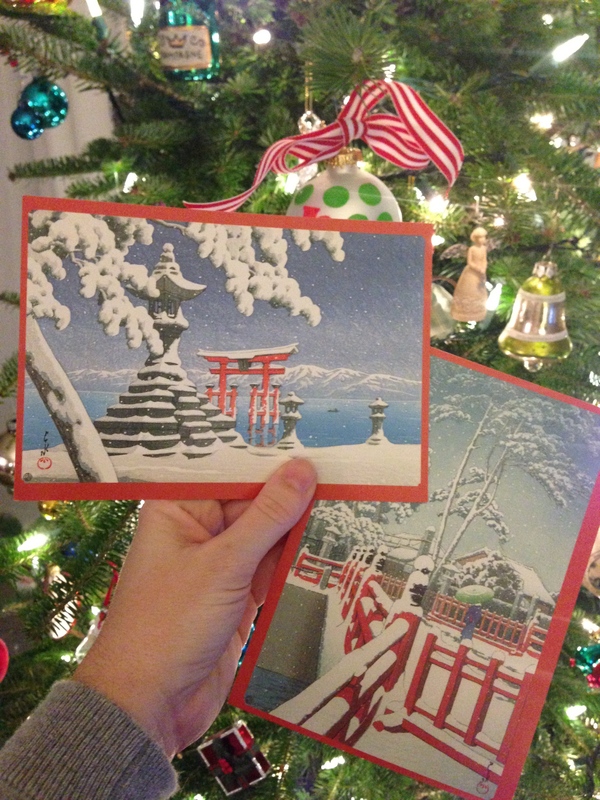 We’ll be writing out our holiday cards and chatting about postal and non-postal topics (the subject of cocktails usually comes up!) 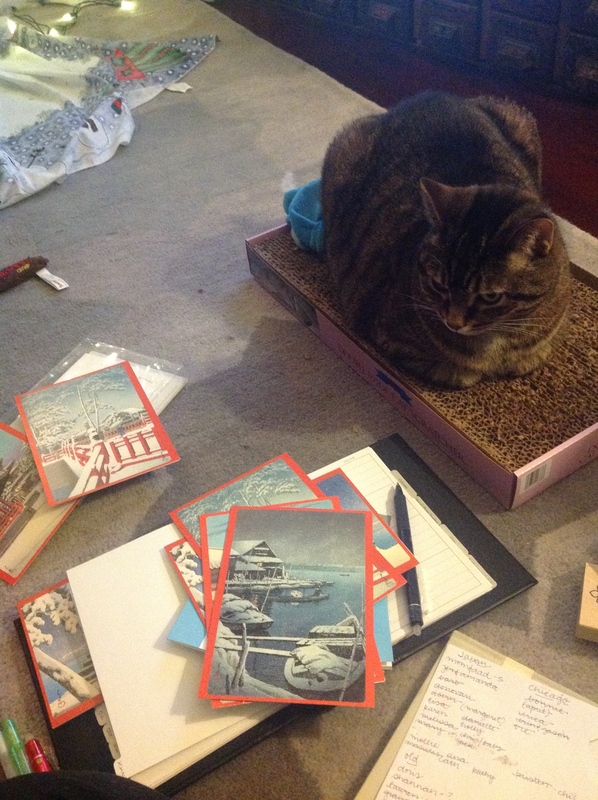 So get out your Christmas cards and a cup of tea and join in! Have you gotten any cards yet? 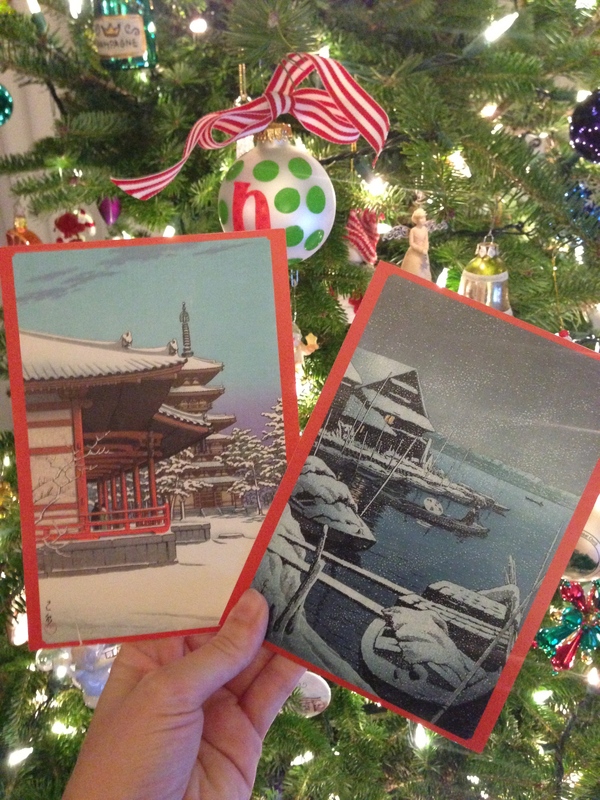 My Aunt Karen was the first this year, closely followed by Ryan, whose card came from the North Pole again! 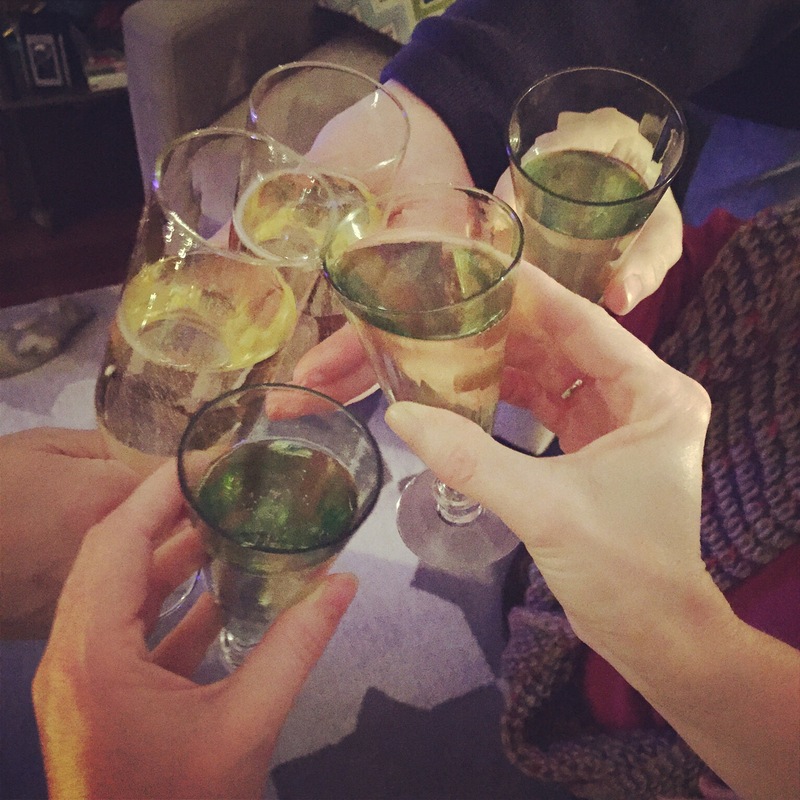 Another book club holiday tea is in the books (hehe) and we’re onto a new year. December book club always falls around winter solstice, so it was rather dark all day at Peggy’s, but hopefully you can appreciate the beauty of the rooms and the table settings in spite of my dark pictures. 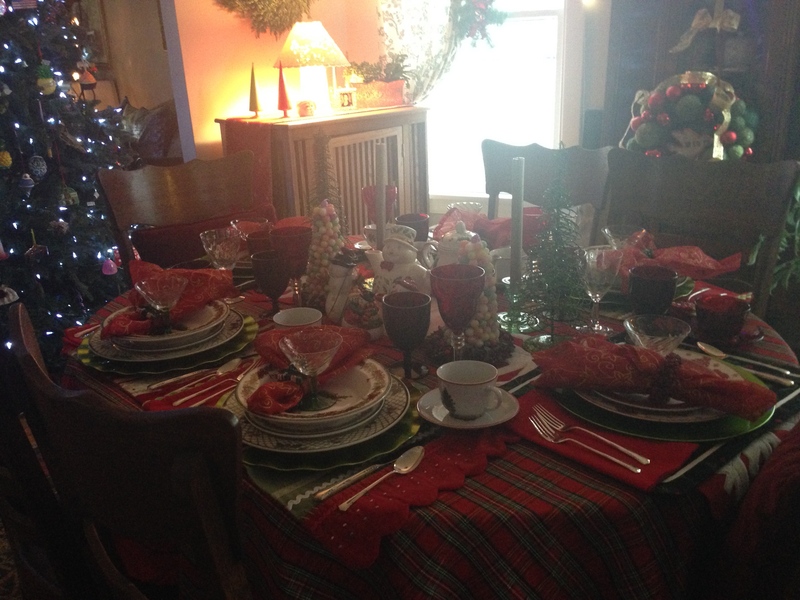 We split into two tables, each seen above, and as always the place settings were festive and lovely. Peggy should seriously give lessons on how to set a table because I always feel like mine lack the layering that hers have. She has such a great mix of dishes to play around with, too. 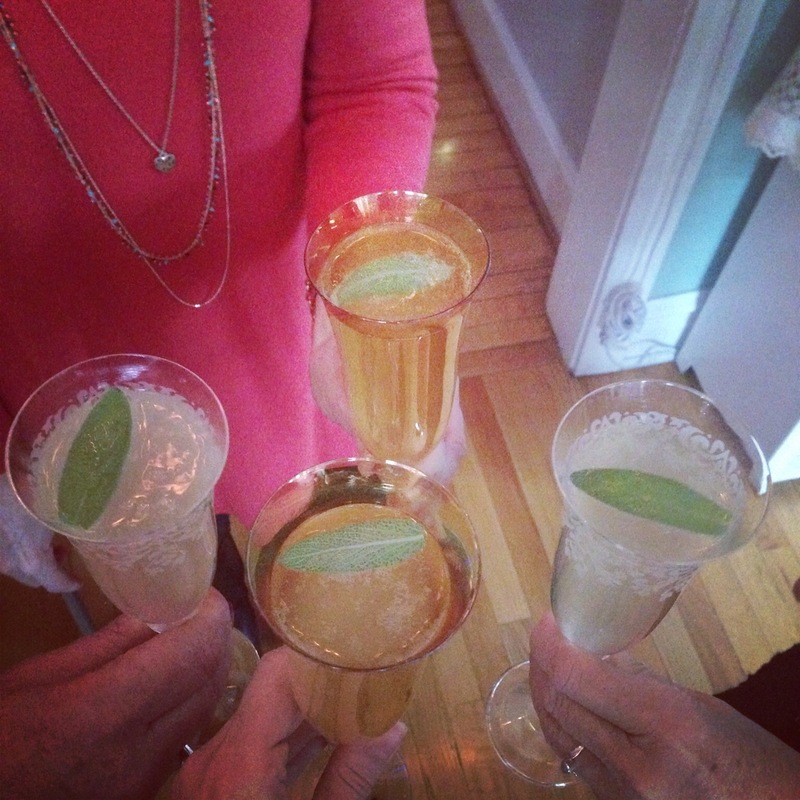 We started the morning with a cocktail–ginger sage prosecco. We found the recipe here and I made the syrup, which is easy and delicious and amazingly useful in other cocktails too. It’s warm and wintry, perfect for this time of the year. Bruising the sage leaf before you float it on top of your cocktail is also highly recommended. Our menu was very similar to last year’s menu. I made ham salad tea sandwiches again, and they were served alongside pimento tea sandwiches and classic cucumber tea sandwiches. We had two kinds of scones, cherry almond and coconut, served with Devonshire cream, Meyer lemon curd, lime curd and lilikoi curd. And we had Christmas cookies and lemon squares and lots and lots of hot tea. For our book this month, we read Emma–our first dip into Jane Austen. Sadly, only a few finished the book (which is rare for us!) so the book discussion was not as long and as deep as usual. But lesson learned, choosing a lighter book in December may be the way to go. After the book discussion, we lingered on in Peggy’s comfortable home and chatted about our Christmas plans, families and other books. I’m looking forward to another year of book club, and more reading in general. I didn’t read as much as I should have in 2014, so it’s time for a fresh start. For January we are reading Ethan Frome. Edith Wharton is a favorite of mine, so I’m looking forward to it. 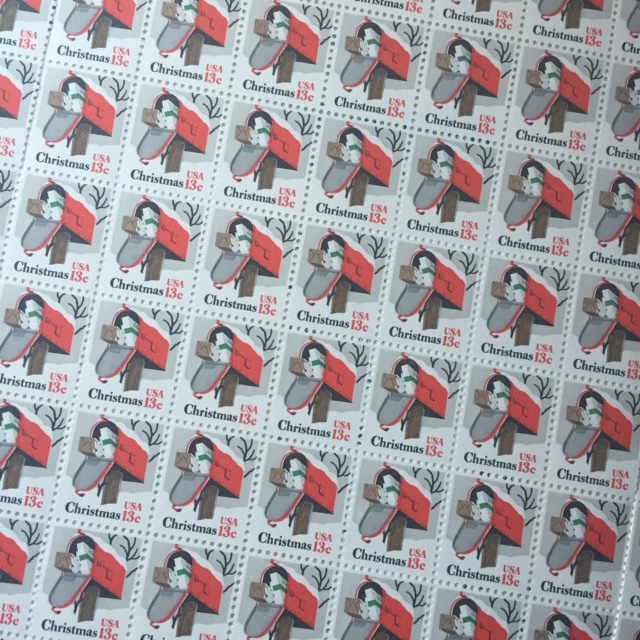 We don’t have any other titles planned for the year, which is a preferred way to go. Last year we planned an entire year ahead and a few of us felt stuck with some of the titles. It’s nice to plan a little at a time, and leave some openings for interesting titles that pop up in the newspaper or recommendations from friends. If you’re in a book club, I’d love to hear how you choose your titles. Happy New Year! I spent a bit of time yesterday reflecting on how much I failed at my intentions from 2014. Maybe I’ll talk about it on an upcoming blog post, but most likely, I’ll just look to the future. I can honestly say, after 2014…I welcome 2015 with open arms. (Oops, I fell off the blogging wagon last week. It’s still okay to post about Christmas stuff, right?) After the pickle, I chose to buy an orange slice and an apple slice for my next ornament purchases. They both really pop on the tree with their glittery edges and bright colors. The apple came with a little story card that explains how the apple is a symbol of temptation in Christianity. 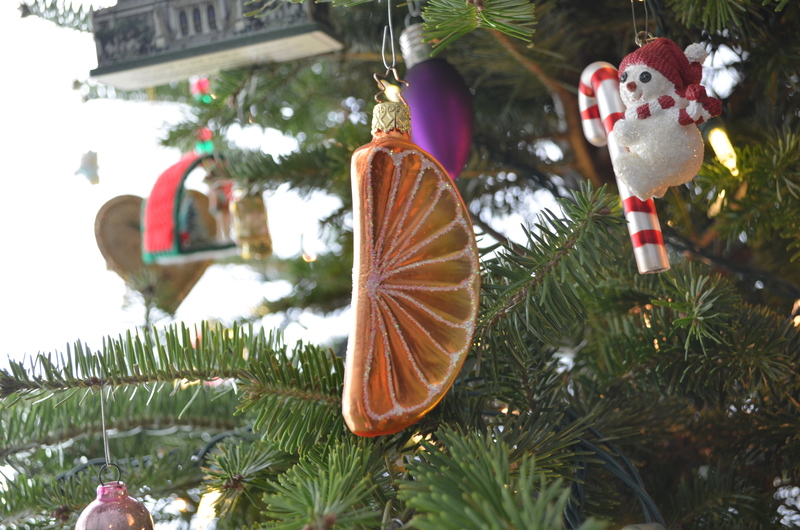 The orange didn’t come with a story, but it always reminds me of getting the tiny oranges in our stockings as kids. And a cigar–its burning end is my favorite detail, black and glittery. I purchased this ornament before I met Naoto but oddly enough one of our first dates involved a cigar bar in Greektown. We were the only non-old men in the place and it was a lot of fun. My parents added to my collection with a teapot and a ruby slipper. I love the delicate little teapot and the bright red glittered shoe. 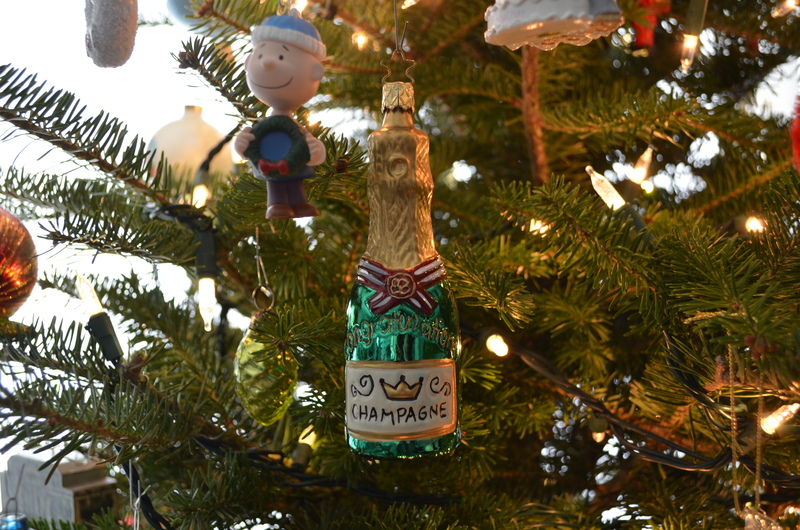 The last Inge-Glas ornament I received was the champagne bottle–an engagement gift from my parents. Naoto and I have a lot of “First Christmas” ornaments, but this engagement ornament is my favorite. This year it’s front and center (along with Charlie Brown) on the tree. 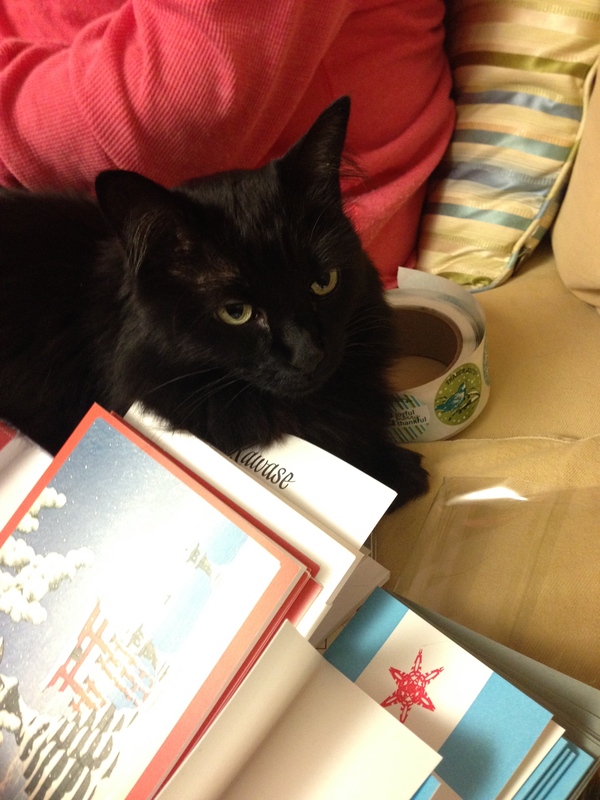 Naoto is already asking when we are taking down the tree…but I’m not quite ready yet. I’m still enjoying the Christmas lights…it’s been so gloomy and cloudy here that it’s nice to have a little brightness and sparkle inside for a little bit longer. For the other Oh Tannenbaum ornament posts, go here. 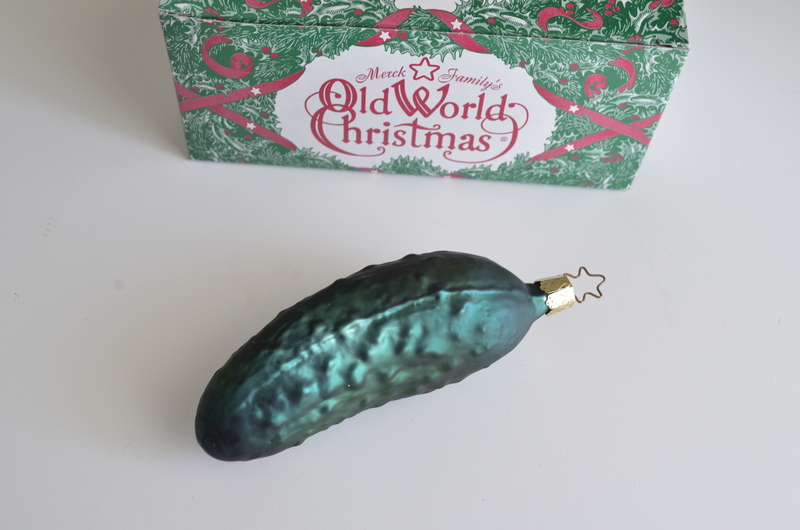 Do you know about the Christmas pickle? 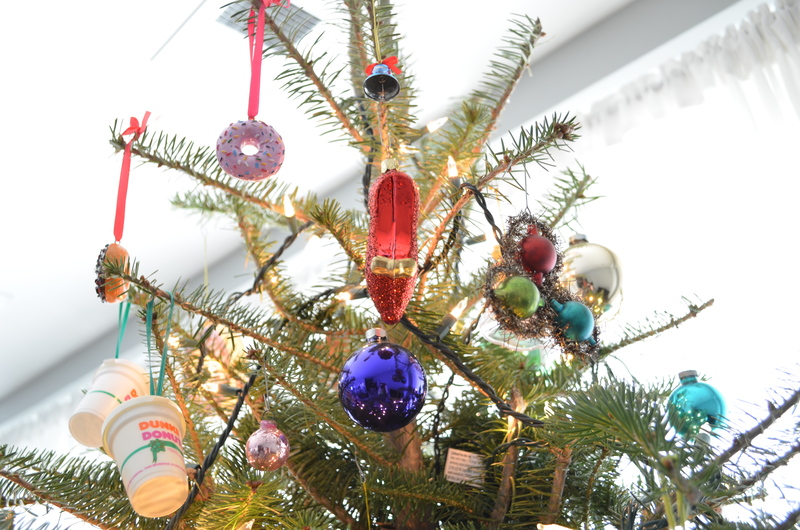 A German tradition, a pickle ornament is the last ornament hung on the tree, disguised among the green branches and hidden by the other colorful ornaments. On Christmas morning when children wake up, they search for the pickle. The keen-eyed child who finds the pickle gets an extra gift from St. Nicholas. Isn’t that a fun tradition. Since we got Presley, I’ve kept the ornaments off of the tree. Instead, I chose to display them in my china cabinet. But they always got forgotten. 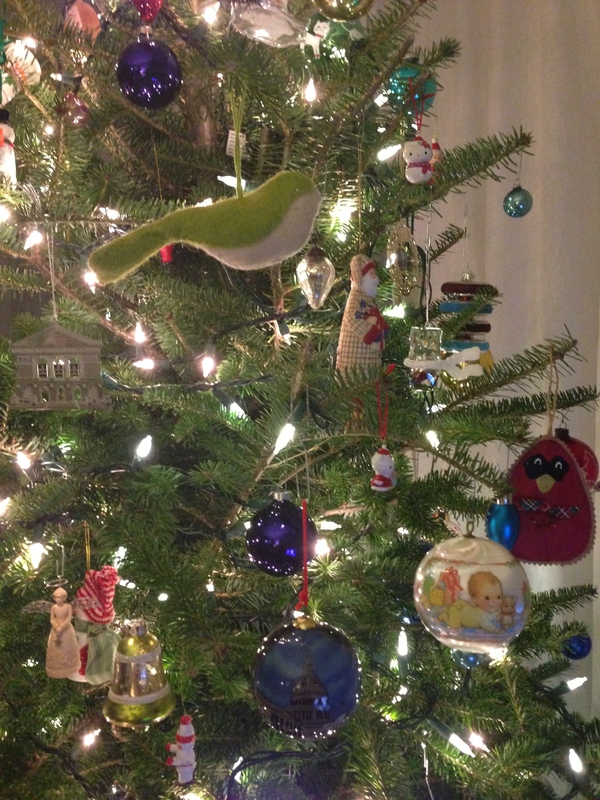 This year, I couldn’t resist…I hung all of them, except the pickle, on my tree. 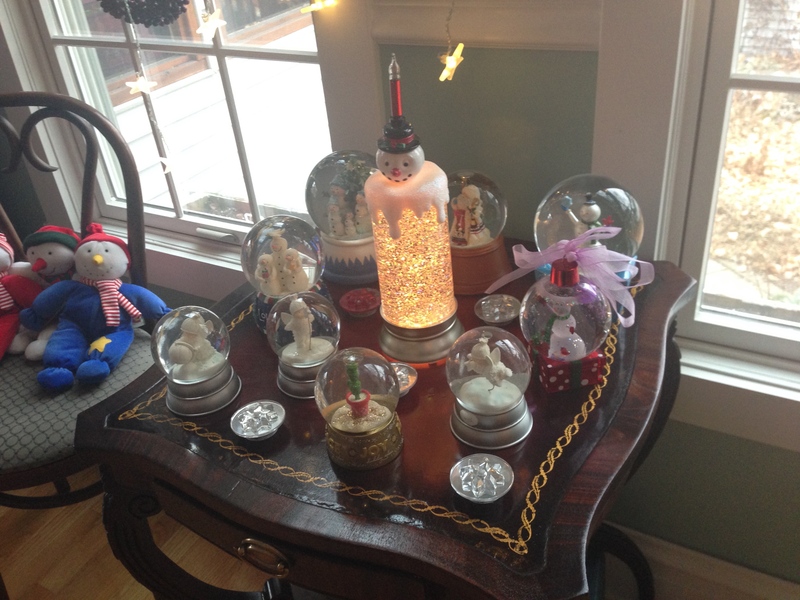 I have a lot of ornaments, and all of them are well-loved, but the Inge-Glas ornaments really stand out. They belong on the boughs, glittering among the lights. This week, I’ll share a bit about the others, too. 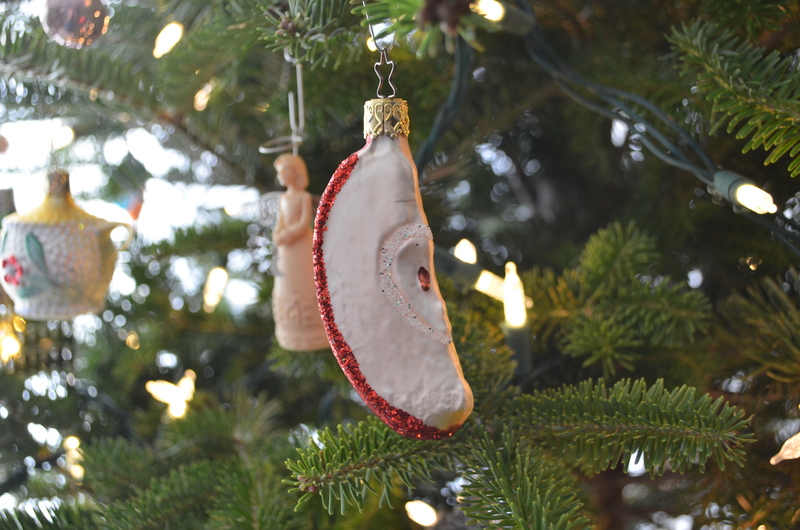 To see the other ornament stories from previous years, go here. When I was growing up, we always got a real tree for Christmas. I remember always being cold and annoyed at the tree farm while my parents picked out a tree. I remember being bummed that we couldn’t get our tree right after Thanksgiving. (“It will dry out!”) I was jealous of the families who dragged their fake trees out of the basement and got to decorate for Christmas right away. When I graduated from college, I bought a cheap fake tree at Kmart. It was fine, but it really did lack pizazz. I had it for years but once Naoto and I got married, I convinced him that we should try a real tree. (If we could turn back time, I bet he would veto that decision.) 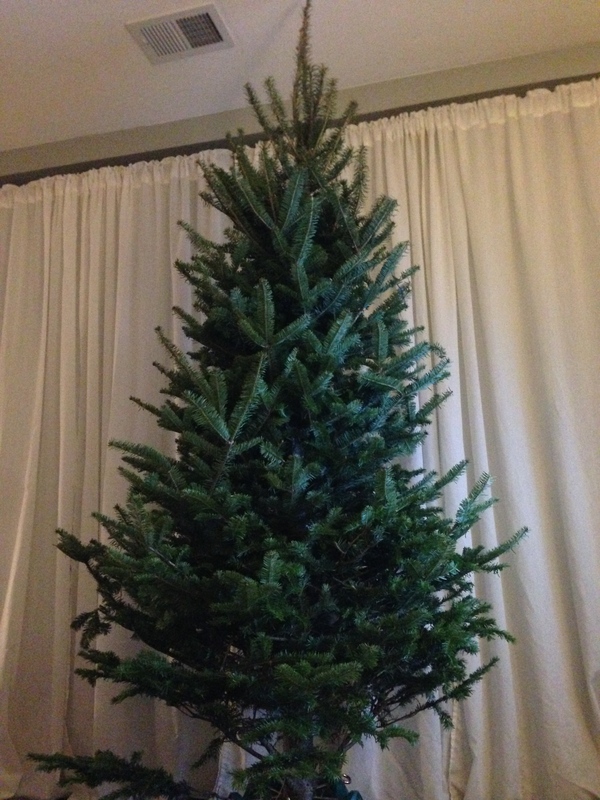 So, we bought a $9 tree stand (which still serves us very well) and found a tree at Menards. 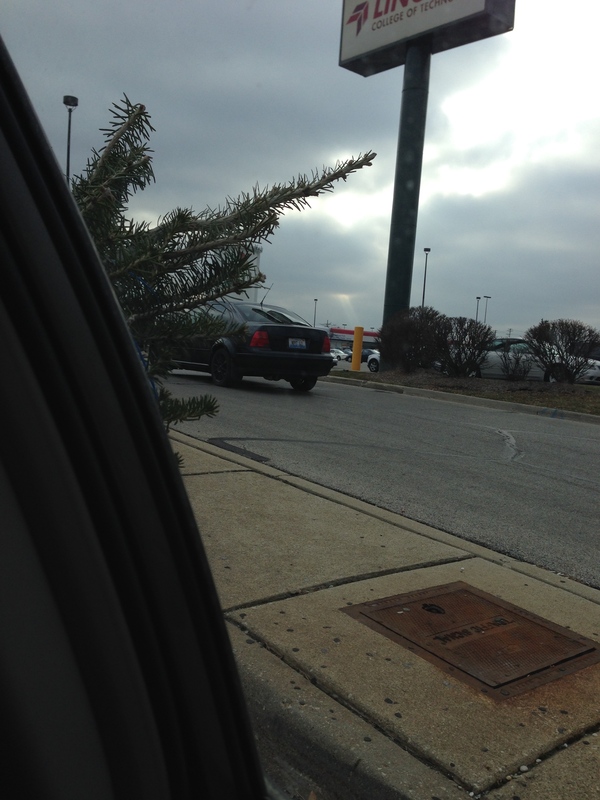 I know it’s less than picturesque to buy a Christmas tree in a home improvement store parking lot, but it works for us. Their trees always go on sale the Sunday after Thanksgiving, the price is right and, at this point in my life, I don’t need to visit a tree farm with an ax to make my Christmas complete. Growing up, I think we always got a Scotch pine. They are very traditional looking Christmas trees, very full, very green. Scotch pine needles are medium length and their branches are really strong, good for heavy ornaments. My issue with Scotch pines–the needles are verrrrry pokey. I guess my dad never minded getting stabbed with thousands of pine needles when he was manhandling the tree into the stand? Naoto and I always alternate between White Pines and Firs, either Balsam or Fraser. 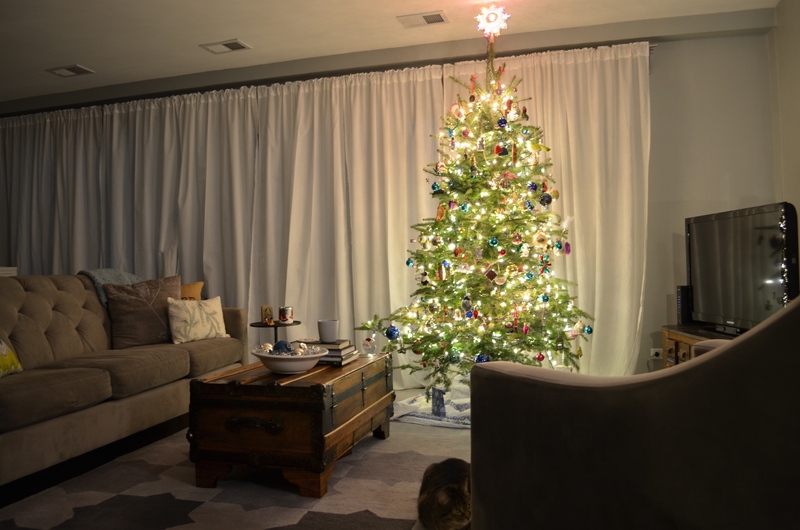 White Pines are one of the least expensive trees ($14.95 on sale at Menards for a 6-7 foot tree, the same price as Scotch pines) and they are really full and lovely with their long, soft, deep-green needles. They also, in my experience, last a really long time, staying green and fresh past the New Year. The big downside to the White Pine is that sometimes the branches are floppy and they don’t support the weight of ornaments as well. And they are so full and the needles are so long that tiny ornaments tend to get lost in the tree. But, the trees are so pretty and traditional looking that I don’t always mind leaving some of my ornaments off for a year. Balsam Firs and Fraser Firs are my favorites, but maybe that’s because we have a Fraser Fir this year. (Every year’s tree is my favorite.) They are more expensive ($24.95 on sale at Menards for a 6-7 foot tree) but it’s totally worth it. Both are skinnier trees with short needles. Balsams have more olive green needles and Frasers have blue-green needles. 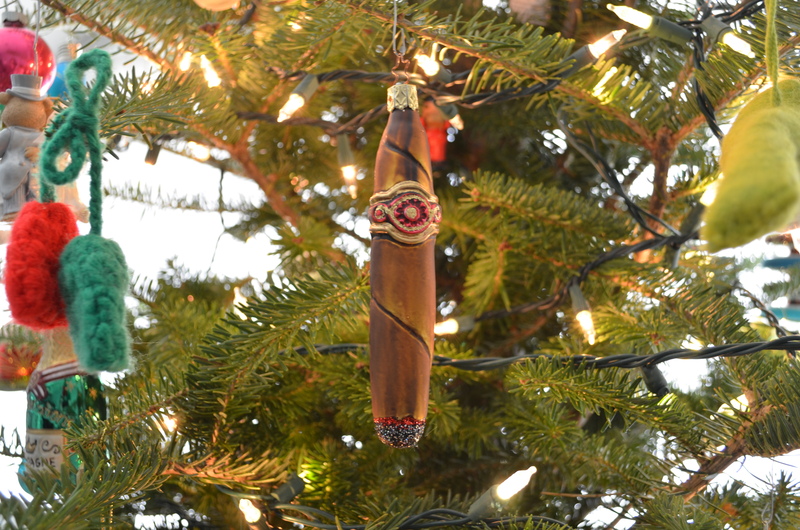 The shorter needles allow tiny ornaments to shine. 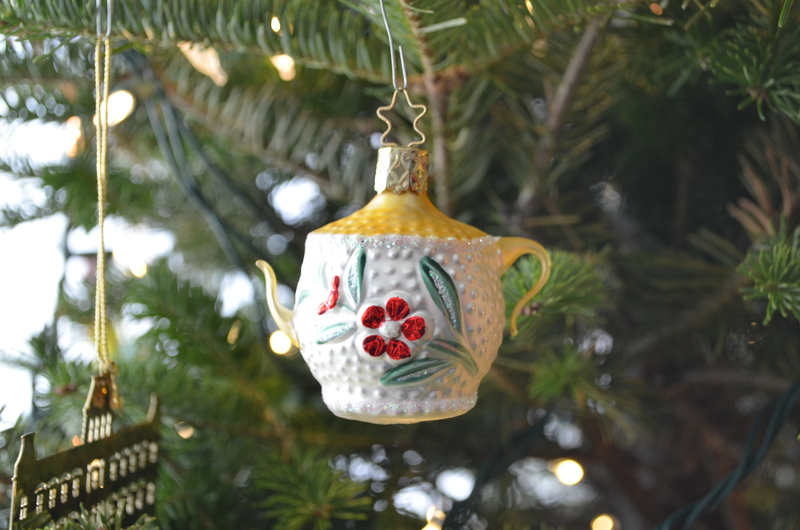 Both trees’ branches are sturdier, so they can handle heavy ornaments. 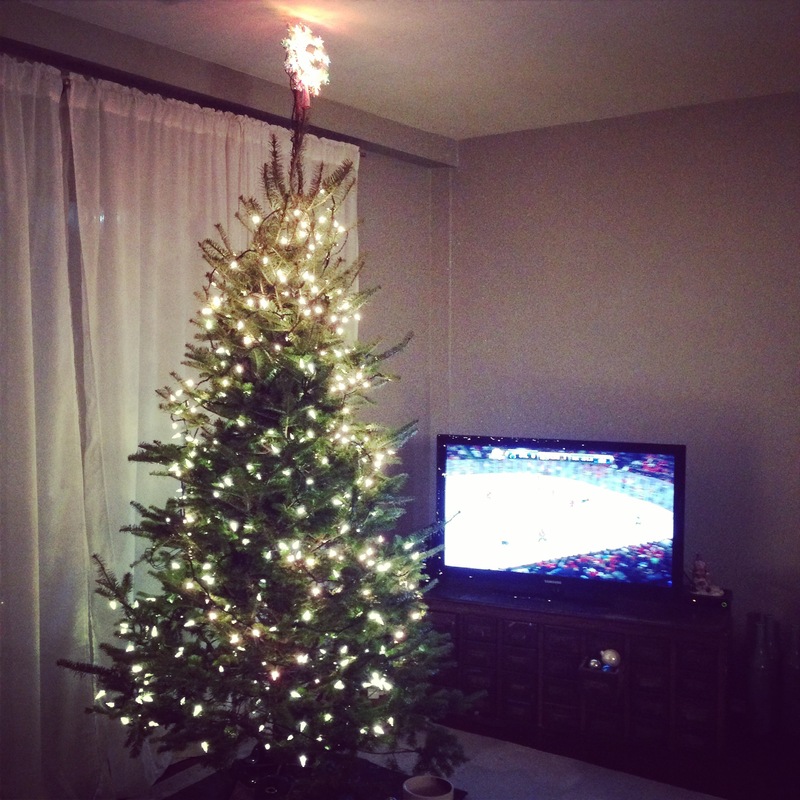 And the branches are more spread out, leaving room for larger ornaments to dangle. Supposedly both retain their needles well, but in my experience, they do dry out a bit faster than the pines…this could just be my luck with trees though. Both Balsam and Fraser Firs have incredible scents…our tree has been around for more than a week and it still smells divine in here. P.S. This post is not sponsored by Menards–we just like their trees. For further reading on Christmas trees, I found this interesting, educational website. I feel like someday I need to expand our tree search and try a spruce or a cypress! This was the scene on Sunday night when Naoto and I went to buy the tree. We decided to branch out (hehe) and try other tree variety this year. We’ve had a White Pine for the past two years (2012 and 2013) and this year I wanted to change things up with a Balsam Fir. 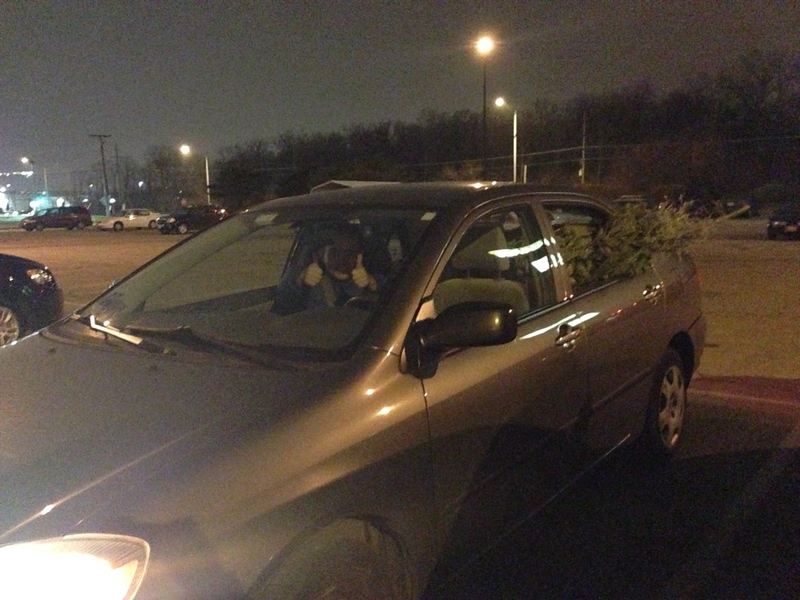 So, it was after 6:30 and dark, but we thought there was enough light in the parking lot to choose a tree. After checking out a few, we chose a lovely Balsam, had it wrapped up and drove it home (using our back-seat method as shown above.) We got it into our apartment and cut it open and…I noticed a patch of brown. Not like a tiny bit of brown needles that were falling off, but a chunk of brown needles that faded into green, like the tree had been damaged by the weather or something. I shrugged it off thinking we could put that part towards the window and no one would ever know. 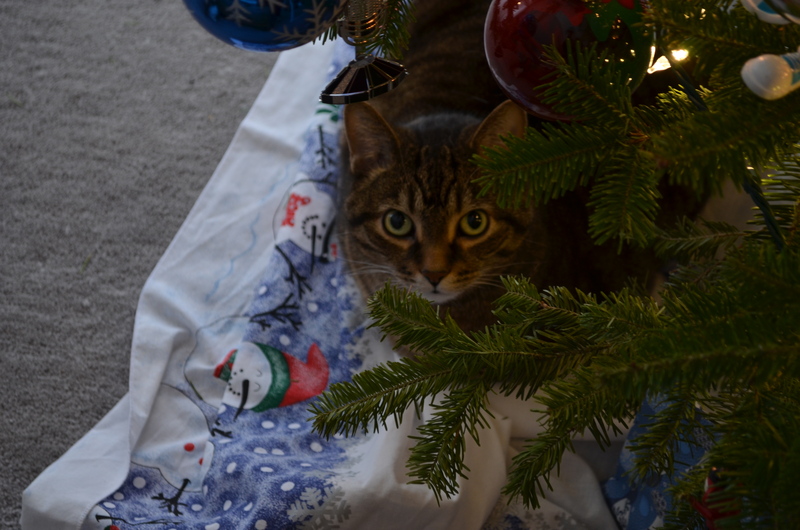 But then I noticed that brown spots were occurring all over the tree. The tree could only be described as mottled at that point. 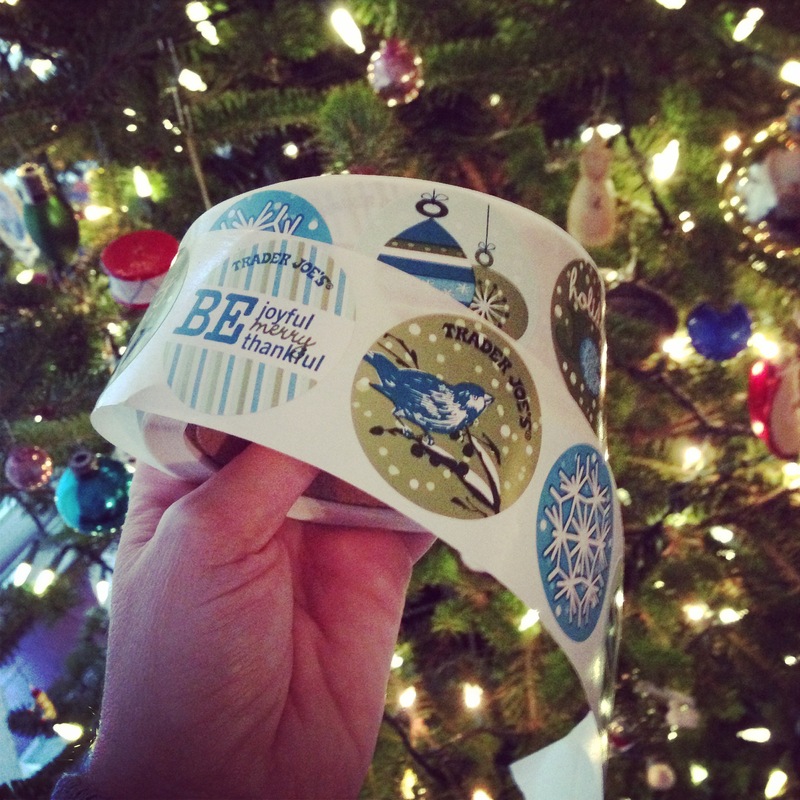 Now, I am not a perfectionist when it comes to the holidays. 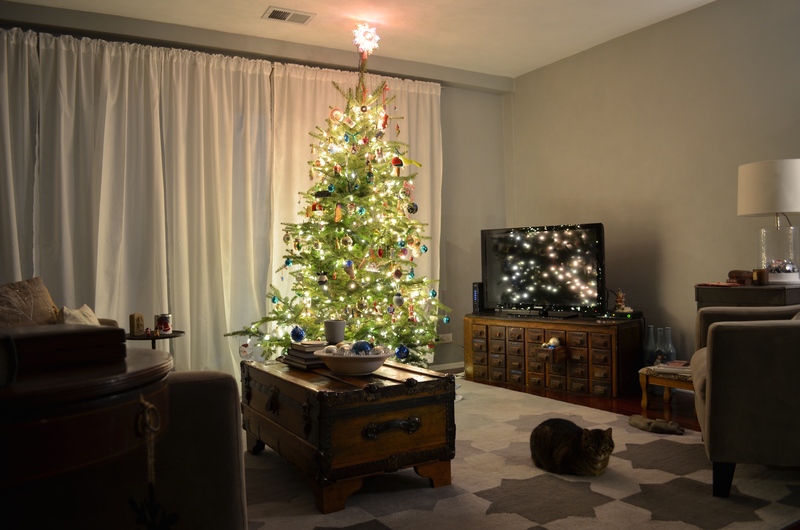 We’ve had holey trees, crooked trees, dry trees…pretty much every year we buy an imperfectly lovely tree. But, brown? I couldn’t do it. So I said the words my poor husband was dreading, “We have to take it back.” We loaded the tree back into the car and drove back to Menards, which was closing in the next ten minutes. We returned the tree, and in spite of the “tree guy” offering to open the lot back up and let us choose our replacement, we decided to wait until daylight to choose another one. (Even with the flashlight on my phone, it was hard to see the brown spots on the tree. We didn’t want to risk having to return another one.) I went back alone on Tuesday afternoon to choose another tree. Several of the Balsams we opened had the same brown damage as our first tree. So, I moved onto the Fraser Firs, which look similar to the Balsam but have a silvery tone to the underside of the needles. 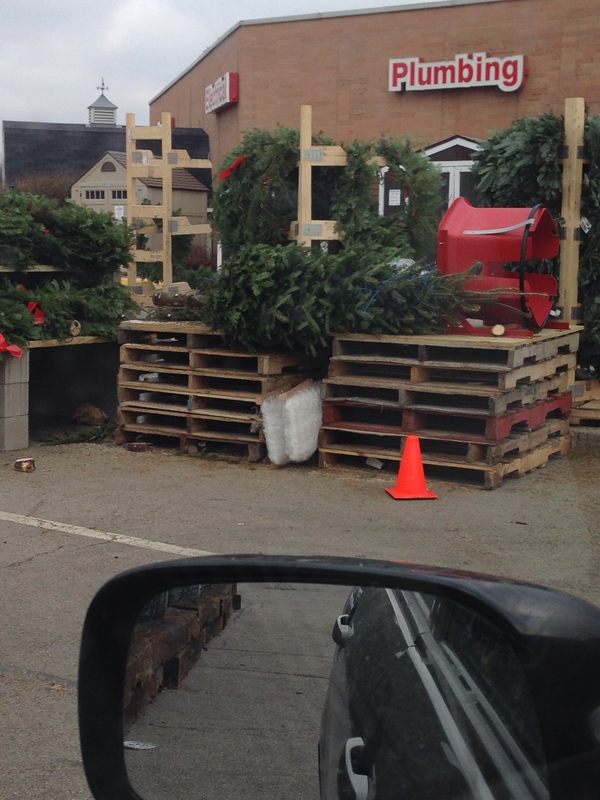 Between the tree guy, another customer and I, we found a good one…straight and tall with no noticeable browning. (It’s pictured on the trunk trimming table above.) 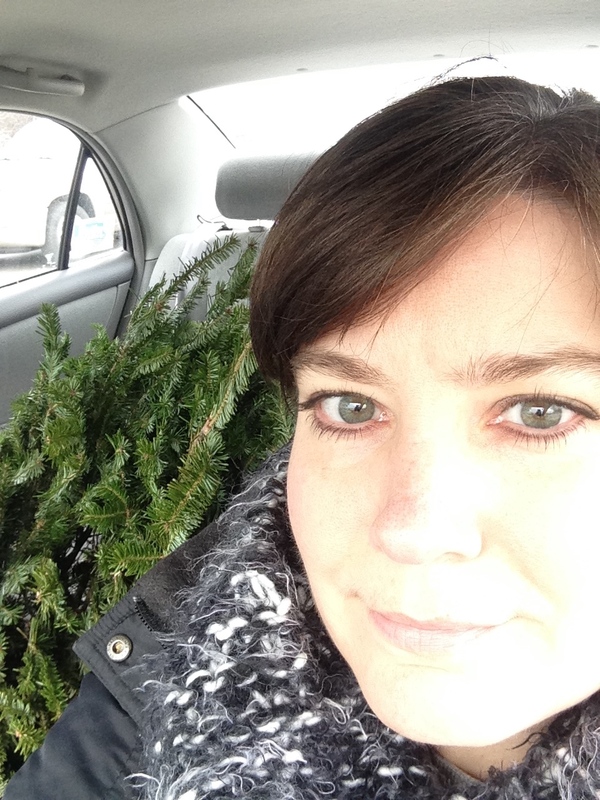 The tree guy–after much skepticism–loaded it into my backseat and I drove it home (after taking pictures in the parking lot!) 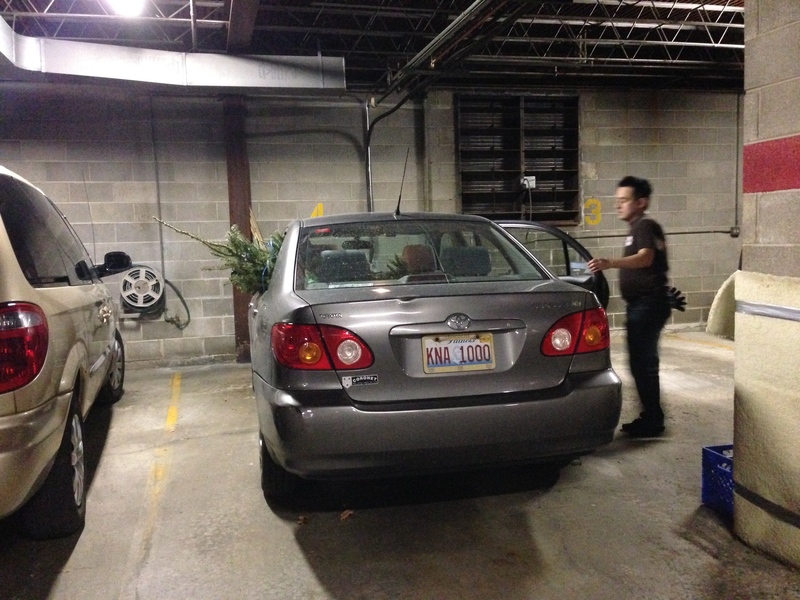 The tree stayed in the backseat of the car in the garage until Naoto got home that night (after midnight!) I could have carried it up by myself, but I could never have put it in the tree stand alone, so I figured leaving it in the car was better for the tree as opposed to leaning it in our entryway all day. (Also there were a bunch of judgey ladies in the laundry room and I didn’t want to have to deal with explaining how I would of course come back down to sweep up my pine needles…sigh, the costs of living in a condo.) Here it is all watered and ready. I (unevenly) added lights last night and I’m hanging the ornaments today. And then, our apartment is officially ready for Christmas!